Christopher Lee as Count Dracula! As he appeared in the 1970 Hammer Studios film Scars of Dracula. The spooky 1:4 scale statue stands about 21-inches tall! Features a fabric costume with swirling cape and a detailed diorama base. Christopher Lee as Dracula is the debut figure for Star Ace Toys' line of 1:4 scale mixed-media polyresin statues. Featuring Mr. Lee as he appeared in the 1970 Hammer Studios film Scars of Dracula, this astonishing figure presents the beloved movie icon in one of his most famous roles. Now you can feel the fear of Count Dracula with this large-scale statue! The detailed diorama base depicts the castle where Dracula lived in the film, and the fabric costume with swirling cape perfectly captures the famous vampire's formal wear. 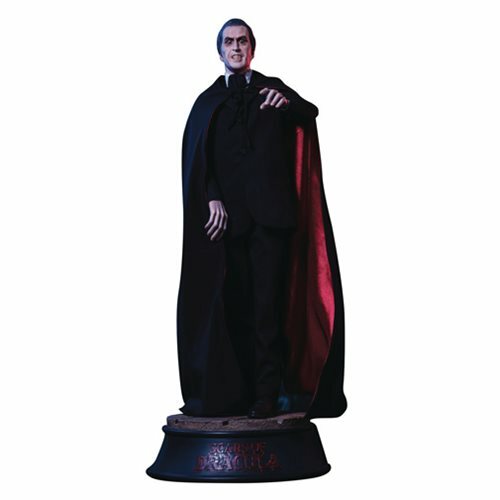 This spooky Scars of Dracula Count Dracula 1:4 Scale Statue stands about 21-inches tall!